Former Gov. Paul LePage and Gov. Janet Mills. Outgoing Gov. 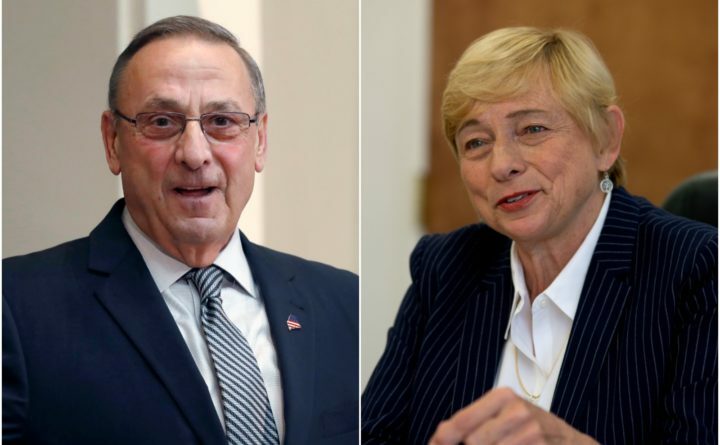 Paul LePage on Tuesday said he wants Gov.-elect Janet Mills, once she becomes governor, to take over lawsuits that he filed against her office during her tenure as attorney general. In a Tuesday statement, LePage said his appeals of Maine Superior Court Justice Michaela Murphy’s decision favoring Mills and her ability to weigh in on out-of-state lawsuits, “should not be mooted” just because the attorney general’s office is changing hands. “The public interest would be served by [Mills] agreeing to have these cases continue,” he said. Mills has told LePage she will dismiss them when she succeeds him Jan. 2. The pair in their respective roles have a storied past of professionally and legally butting heads that spilled over into Mills’ gubernatorial campaign. Mills joined a California lawsuit against President Donald Trump’s administration last year over his winding down of the Deferred Action for Childhood Arrivals program. LePage, who said she was violating state law by joining an out-of-state lawsuit without his or the legislature’s permission, sued Mills back. In October, Maine Superior Court Justice Michaela Murphy ruled against LePage, who promised to appeal. Mills filed a separate suit against the LePage administration in the fall for withholding millions of dollars from her office, which Murphy also decided in her favor. A third legal battle culminated last month when Murphy mandated that LePage authorize the state’s Medicaid expansion. LePage tried to block that order earlier this month, so Murphy delayed implementation until Mills, who vowed to enact it almost immediately, takes office. Assistant Attorney General Jonathan Bolton, in a Dec. 11 letter, said Mills intends to seek “dismissal” of the appeals LePage filed against her office once she becomes governor. LePage in his public plea Tuesday, said the appeals “are not personal to us as individuals” but can, instead, shed light on the roles both the attorney general and governor’s office should play. “If a time comes during her administration where there is again divided government, she may regret not having pursued this lawsuit,” he said. Correction: An earlier version of this report incorrectly stated that Gov. Paul LePage is appealing a Maine Supreme Judicial Court decision. He is appealing a decision by Superior Court Justice Michaela Murphy that generally supports the argument that Maine’s attorney general does not need approval from the governor to weigh in on out-of-state lawsuits.